This EA is designed to monitor the slippage of opening and closing orders, and save the records in files. It is useful to record the slippage and evaluate brokers. 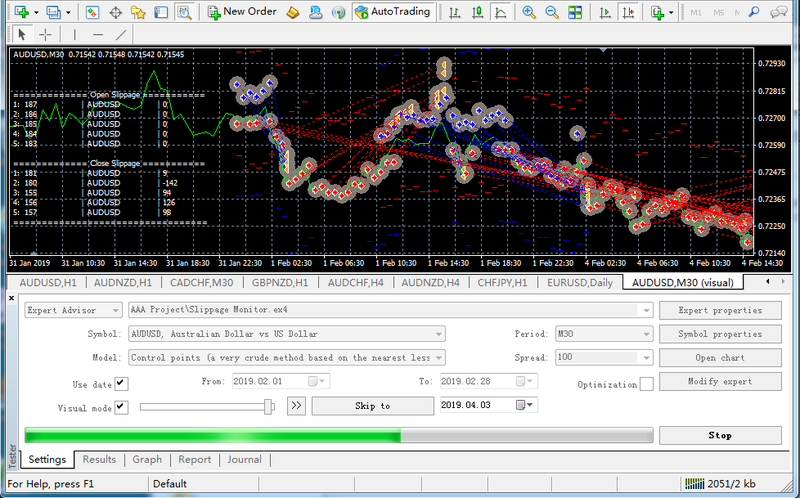 The record files are saved in the folder MT4_Data_Folder\MQL4\Files. Go to "File " --> "Open Data Folder" . Warning: Do NOT open the files directly, otherwise it will affect the exectution of EA, just copy them to another folder and open them. Show in brief - If true, EA will show the latest 5 open/close slippage in point. Record File Type - Select the file type: TXT or CSV. I recommend TXT. Example Open Slippage: Slippage Monitor(60249928)-open.csv. It is the open slippage record. Open Price -- It is the real open price. Slippage -- It the difference in point between Prior Price and Open Price. Example Close Slippage: Slippage Monitor(60249928)-close.csv. It is the close slippage record. Close Price -- It is the real close price. Slip Point -- It is the slippage in point between Prior Price and Close Price. for sell order close, Slip Point = Prior Price - Close Price, it is in point. Close Profit -- It is the real close profit.